Chapter 1. Fluorescence Spectroscopy: Principles and Application to Biological Macromolecules. (J.R. Lakowicz). 1. The phenomenon of fluorescence. 2. Factors affecting the fluorescence emission. 3. Time-resolved fluorescence spectroscopy. 4. Harmonic-content frequency-domain fluorometry. 5. Summary. Acknowledgements. References. Chapter 2. Raman and resonance spectroscopy. (P.R. Carey). 1. Introduction. 2. The units used in Raman spectroscopy. 3. A model for Raman scattering based on classical physics. 4. Raman and resonance Raman scattering: a quantum mechanical interpretation. 5. Polarisation properties of Raman scattering. 6. Basic experimental aspects. 7. Raman studies on biological materials. References. Chapter 3. Rapid reaction methods in biochemistry. (Q.H. Gibson). 1. Introduction. 2. Continuous flow. 3. Stopped flow. 4. Combinations of flash photolysis with other techniques. 5. Temperature jump. 6. Miscellaneous methods. 6.1. Competitive methods. 7. Data reduction. References. Chapter 4. HPLC of nucleic acids. (M. Colpan and D. Riesner). 1. Introduction. 2. Techniques. 3. Applications. 4. Concluding remarks. Acknowledgements. References. Chapter 5. Reversed phase high performance liquid chromatography of peptides and proteins. (M.T.W. Hearn and M.I. Aguilar). 1. Introduction. 2. Retention relationships of peptides in RP-HPLC. 3. The relationship between retention behaviour and hydrophobicity coefficients. 4. Bandwidth relationships of peptides in RP-HPLC. 5. Dynamic models for interconverting systems. 6. Conclusion. Acknowledgements. References. Chapter 6. X-ray and neutron solution scattering (S.J. Perkins). 1. Introduction. Part A: Theoretical and practical aspects. 2. Theory of X-ray and neutron scattering. 3. Experimental practice and instrumentation. 4. Applications of X-ray and neutron scattering. 5. Conclusions. Acknowledgements. References. Chapter 7. Electron microscopy. (W.F. Voorhout and A.J. Verkleij). 1. Introduction. 2. Negative staining and metal shadowing. 3. Thin sectioning. 4. Low temperature techniques. 5. Conclusion. Acknowledgements. References. 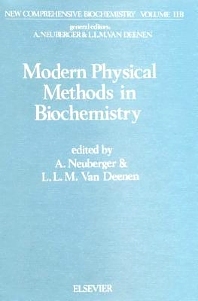 This volume completes the account of physical methods used in biochemistry that was covered in Volume 11A, which was published in 1985. It deals with fast reaction methods, high performance liquid chromatography of peptides and proteins, fluorescence spectroscopy, neutron and X-ray scattering techniques, and also Raman and resonance spectroscopy which have in recent years been used to an increasing extent in biochemistry. This addition to the invaluable series New Comprehensive Biochemistry will be of interest to all those working in the fields of biochemistry and biophysics.